Tony Blair is one of the most influential statesman in the world and during his time as British prime minister, he helped bring both prosperity and division to his country. Tony Blair is your Connector of the Day. 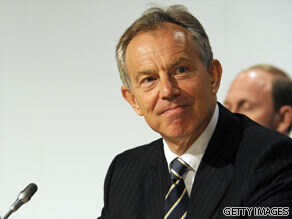 Blair, who was prime minister from 1997 to 2007, helped bring the Labour party back into power after nearly two decades in the political wilderness. Many Brits may remember Blair for bringing prosperity to their country, but many others will remember him for his decision to send British troops to war in Iraq. Since Blair left office, the 57-year-old has been keeping busy with a number of important initiatives, including acting as an envoy for the Middle East and consulting for a number of private firms. Today, as part of the Tony Blair Faith Foundation, Blair is working closely with a new project called "Faith Shorts 2010." The global film competition is an opportunity for young people to express their faith through film - whether it be Christianity, Hinduism or Islam. The top 50 filmmakers were given camera equipment to showcase religion and the way they believe it breaks down barriers. "By gaining insights into the lives of young people across the world, this competition has the potential to build bridges across cultural and religious divides," Blair said. "I hope this competition will provide a platform for creative and talented young people and an opportunity for filmmakers to see their work promoted on the global stage." How do reconcile your efforts for peace in the Middle East with your complicity with the war in Iraq and documents such as the Downing Street memos. My question would be: What is your opinion about those who say that religion (ALL of them) causes more problems and divisiveness than solutions? Having said that, I do commend him on this idea to bring people together. Education IS key to understanding. A for effort! What is your opinion on the 2008 controversial Islam-Dutch film Fitna from Geert Wilders, a Dutch politician and leader of the Party for Freedom (PVV)? Peter Mandelson has said in his book that you didn't get on with Gordon Brown who succeeded you as Prime Minister. What do you really think of Gordon Brown and what are your impressions of the new British Prime Minister, David Cameron? Did you agree revoluation or reformation? If, to win a war and to prevent a war they are equal important, to win a war is not a best way, to prevent a war is not a only choice. How do you think about the future stability of the coalition government of UK at the moment? Do you think about a potential problem for this government? I guess you know the Political situation of Ethiopia, and you are friend of the Ethiopian Prime Minister, What do you feel about the Ethiopian Prime Minister stay in power for 24 years including the coming 5 years? What do you see the position of Ethiopia 10-15 years do you agree on the Prime Minter says? what about the relation of Ethiopian Christians ans Islam? I am a Cameroonian student in Germany. My question is, mindful of your good heart towards Africa (which most western leaders lack), what is your greatest regret when ever you look at Africa today, something you could have changed or help change as PM. Did you ever believe Taoiseach Bertie Ahern and your efforts in the North of Ireland would eventually lead to such a peaceful settlement. Granted, the dissidents still pose some threat but we a a thousand miles away from the situation in 1997 and a million miles away from the situation in the 70s and 80s. Considering the Sinn Fein and the DUP were sworn enemies of one another and are now sharing power in Belfast is this like a dream come true for you? Would you say that films such as 'The Queen' and/or 'Special Relationship' present an accurate image of you and your modus operandi in the British government? Could you please tell us how faith is a powerful force for good in the modern world and how it provides a viable solution for many pressing global problems? What will you say about the CIA’s final report dated April 25, 2005.. "the hunt for weapons of mass destruction has gone as far as feasible and has found nothing, closing an investigation into the purported programs of Saddam Hussein that were used to justify the 2003 invasion". Do you think that the use of media management and people like Alistair Campbell or Andy Coulson are a good or bad addition to British Politics? The reform of the House of Lords only went as far as removing the hereditary peers and creating a majority in the Lords for your Labour Party, do you regret not going as far as elected Lords, and why didn't you? Without the non-religious people of this world trying to arrogantly convert the religious, do you think that likes of eg. Richard Dawkins could actually have some useful input in the promotion of religious global understanding? Jamie Douglas is writing from Patagonia, Argentina. we strongly believe that change and transformation of society and her values lies with the young people, the wealth of a nation is in her values expressed in her young people, and we must commend the former british prime minister for his resolve to strengthen the values of young people irrespective of the faith they represent. Mr Blair, whichever way you may want to portray yourself in the eyes of the public, as a PM or businessman or an envoy. Your past and current contacts and relationships highlight the fact that you are a religious extremist just like people you fought. The only difference between you and Mr Ben Laden or the Talibans is that you are a legal terrorist hidden in today's manipulation of legislations and lobby achievements. One day you will be judged like everyone else, with no one to lobby the lord out of your case. Has changing your faith from anglicism to catholicism made a spiritual difference to your life or any difference? Will we ever know the truth about your term as Prime Minister and will you be the one to tell it in your memoirs? How will Gordon Brown and Peter Mandelson be protrayed and was there really enough justification to go to war with Iraq? Do you feel that the remit of the government of a people is to implement the will of the people? Do you feel that it is the remit of governement to implement what is best for the people, regardless of their will? I assess the first question to relate to democracy, the essence of it at least. Bearing in mind your response to the earlier questions, do you feel that you have conducted yourself in a manner that is sufficiently respectful to the nation you made yourself elligible to serve? Please elaborate to a degree that you imagine the asker of these questions would expect. Given that society worldwide trends towards secularism, what role do you feel Faith & Religion can serve in this 21st Century World Order? How do you sleep at night? you together with G.Bush should be done with war crimes. Most people in the UK hate you for all the misery and deaths you have caused. You are a capitalist and went along with Bush so that you could go to the USA to make your millions. You are supposed to be the UK Middle East Envoy but what have you done for the people in Gaza...NOTHING....I believe that what goes round comes round and one day you will pay the price. Do you see the blood of palestines,s people has the same value of israel.s .if so what is the difference. Am reporting from Portugal,Most people believed that education and accurate religion teaching could eradicate terrorism,dissident,treason,insurgent and defect. How can one intend to give these set of people education when they had already made up their minds with preposterous practise which has being halting world peace,is there a possible solution way to deter their bigoted mindset,rather then sending Soldiers to fight them which in turn lead to waste of Money and life. I feel dissapointed in the section of the electorate that they elected you. Does the fact that the elected you leave you with concern for the future of civilised society? Do you feel that if you intentionally decieved your electorate that a discussion with a Catholic priest (or similar) will absolve you, or any percieved sub or super component thereof, suchas a soul, of any indescretions against that electorate, for instance intentional deception? I was going to ask whether you feel the people of Iraq feel your direction of our nation toward them was beneficial. Somehow i feel that posing the question would be disrespectful to the good folk of that nation. Do you not feel shame regarding the whole Iraq debacle? Do you feel that it is acceptable to have our young men killed in government sanctioned war zones on the present rationale? If so, why? If you felt the world would benifit from your demise, would you fall on your own sword in the samurai sense? Is this the behaviour you expected of Saddam? Do you feel the net result of your actions represent better life for the folk of Iraq and improved security for your electorate? If so, how? There are a lot of questions. I feel entitled to an answer in that I am British and you worked to my fractional ends. I feel disappointed that these answers are not readily available via local government. Are you able to assist in reforming the process? If not, would you choose to should you be in a position to do so? I write this from Sheffield, Yorkshire in true curiousity. A man does not become a politician without concern for society unless he is a nutter. You don't look like a nutter so I conclude you have lost your light. Id that how you see it too? Do you think the invasion of Iraq was justified given that there are no weapons of mass destruction, the main reason for gpoing to war? Iraq is now a very dangerous place, and could have been better if Sadam was still President. He nebver had nuclear ambitions. Do you really have any sympathy to the miseries you have caused to the lives of ordinary Iraqs as a result of a war that had no justification but to meet the imperialist mind of the US and the desire to control Iraqs natural resources? Never mind Africa, everybody gives them, mostly to no avail. My question is: When will you be setting up a foundation for taking care of the many children of the many soldiers who died as cannon fodder while still believing they were saving us from WMD most of us didn't believe existed. Surely its time to show some orginality, after all, the one thing those soldiers must have had in common at the time of their death was faith in you Mr Blair. Why cannot the International Community stop Isreal "settlement" expansion? We give it lip service and then give Isreal more aid. Always been an admirer of yours....and your honesty in regards to your Faith. It inspired me some years ago when . How do you reconcile/Liberal politics with a real Christian Faith? And how did you cope with the moral contradictions of the Labour movement and that of Christianity? How did you handle the pressure of being the 'most hated man in Britain' during the last few years of your administration? In my opinion you are still the best PM Britain has ever had but at the time there were some negative opinions about you. What advice would you give David Cameron? Got cut of in the second line....need to add to when "I observed you confess your faith in an interview very candidly on the BBC". Please correct my comment if possible moderator. Or submitt as it is if you cant. Since your popularity in the US is mainly based on your support for President Bush and Iraq War (look at the medals etc you get), how do you reconcile the huge amounts you earn for lectures in the US with the lack of a massive blair annual donation to the various hospitals and rehab untils that support wounded soldiers. Dont you think that at a minimum you should be donating a percentage of each speech ? Sadly, you tend to come across as rather sleezy now, taking whatever money you can get whilst distancing yourself from any responsility either for the war or the aftermath. What are your thoughts on the situation in Darfur and President Bashir's ICC arrest warrant? Do you think it is fair for the U.S to apply double standards against Sudan? I think England should give up Anglicanism and adopt Catholicism. Do you remember when was your first lie ? I know you were into music and played the guitar when younger. Knowing what you know now, would you rather become a musician? Would you rather be a musician? You were told many times that the war with IRAQ was illegal. the war was legal. WHY and WHY did you lie about what you new. @ priyath What makes you think England should give up Anglicanism a nd adopt Catholicism? Just out of curiosity , I am asking . Hello, you haven't yet finished your job – you must please return Gibraltar back to Spain so it can be ONE contrary the same as making Walvis Bay part of Namibia??? I have the perfect answer to Israel, copy South Africa. Let out all the prisoners, even the murders against the State, change the Flag for ONE country for Jews and Palestians, ONE parlement for ALL Jews and Palistians. There will never be real 100% PEACE if this doesn't happen. It is working in Northen ireland, ONE army, ONE police force! The ANC were once Freedom Fighters, all white males had to join the army for 2 years to fight the ANC, today we live in peace? Sport scantions.were imposed against South Africa in the 60's and today we held the World Cup, put that in your hat!!!! Now South Africa has won The Open, cool! A real Rainbow Nation!!! He became a full blown catholic ONLY after leaving the office!!! Rather interesting ! Perhaps, he now believes he can repent all his crimes by going in to a confession room and ask for forgiveness? But which religion is going to forgive his lies ? Do you believe that Iraq has transferred its WMD to Iran just before US-UK invasion ? Because Iraq knows that US made up his mind to attack Iraq. So its the perfect solution to Embarrass US-UK and its successful. Whats your opinion about this ? I have been a big fan of yours, though I have never been to UK. I My question to you is "We know you were presented with loads of so called evidence by US, CIA and other agents to gain support in Iraq war. What I would like to know is, which of these so called evidence did really trigger you to agree to Bush's wish to attack iraq? Then again, when none of you still couldn't find any mass destructive weapons, how do you really feel for attacking innocent civilians in this so called process of freeing the innocent from the devilish Saddam? How is it that nothing that Israel does seem to be wrong to you or any other politicians? Don't you democratic country people see innocent children and disabled/ old people living in Iraq, palastine etc as human beings? Now that we know that Muhammad read what we now call the 'dead sea scrolls' maybe even stole them and placed them in the cave himself, and never was spoken to by God, is there not a case for telling muslims that he lied and they must change their religion as they will be told by Yeshua they must anyway? Prepare them. We need a single religion. We do not need liers. "God gave them great delusion that they should believe a lie" the Jew's Bible (yours and mine) correctly says. Israel with its continuous policy to expand settlements in Jerusalem and West Bank provoking Palestinians, Arabs, and the Muslim world; do you believe the present Israeli government is genuine about making peace in the Middle East? Doesn’t this undermine your mission as a peacemaker? The peace agreement in Northern Ireland was initiated by PM John Major.Therefore, it is not Tony Blair that should take all the credit. Also, he did not bring prosperity to our country. He brought self gratification for himself and his wife. They took all the free gifts that were going and built up a fortune for themselves at the expense of the British people. His legacy is self importance, greed and warmongerer. He should not be a peace envoy by any stretch of the imagination. Are you part of the Bilderberger group? Is it true that you and other powerful figures want to create a one world government? Do you consider yourself a war criminal and therefore needs to face the ICC at the Hague? He didn't bring prosperity, Labour inherited a booming economy and then borrowed and spent awful lot of money off the back of it. How do you feel about the enduring poverty in British slums that you promised to fight when you first ran for PM? Would you by any chance know the definition of " a pathological liar" ? Hi Tony. I respect you so much for your legacies. But then it seem not to have impacted Africa as much as expected... could you kindly do more to Africa? going to war illegally for O.I.L (oil,israel,lies).After you join with bush to destroy a middle east country, you accepted bush appointment as middle east peace envoy without an ounce of remorse.How callous,cold blooded,immoral,hypocrtical can anyone be,Even in this position you are not repenting for your sins.What did you say or do about Israel's murderous incursion into Gaza,is this area not part of the middle east? You should by now be in the Hague in stripe clothing! war criminal! How do you think the lack of human rights, especially in terms of religion, in Iran will be resolved? Could UK be better if it´s out of EU? I have no doubt Mr Blair's initiative will do well. But I cannot resist asking him when he will live up to his billing as an international statesman and ensure the crisis he started in Zimbabwe, a personal war between him and Mugabe, will give Zimbabweans closure. Mugabe has been and is corrupt, a dictator and does not believe in rule of law but that was not a licence for Blair to call for sanctions on the country, influencing the whole of the western world, and then fade into the limelight and be called "world statesman." It is the people who have suffered and continue to suffer, so why doesnt Mr Blair take on this honourable cause of sorting out his mess before engaging in anything else? I am now beginning to believe Mugabe was right in his railings against Blair because as far as I am concerned, the sanctions have not Mugabe and his cronies, but the poor, myself included. Who should I blame and what does Mr Blair have to say about this? How do you reconcile your Christian faith with accusations of complicity with torture? How do you reconcile your faith with your action in Muslim countries like Iraq? ps Israel can also be a Rainbow Nation, the Poltitions wouldn't have a job! Mr Blair Can You Please Go And Live In The USA Full Time, PLEASE. "Spain's Prime Minister Zapatero has refused to meet Rwandan President Paul Kagame at a UN meeting in Madrid after protesters said his regime was linked to the 1994 genocide in the African country." Tony Blair's view on African presidents accused of Genocide and crimes against humanity is really discus ting..
To Tony Blair, many people say that faith can cause so much devision. It isn't true where the people hold to this statement : "11 We claim the aprivilege of worshiping Almighty God according to the bdictates of our own cconscience, and allow all men the same privilege, let them dworship how, where, or what they may. ". This is the 11th Article of Faith of the Church of Jesus Christ of Latter-Day Saints (commonly known as "Mormons"
Mr Blair, Can you tell me plz what was the most attracted you in politics? Is there some similarities between Jerusalem and Rome,worth considering? Whats actually is happening in U.K. politics ?whats the reason Labor or Gordon Brown losing the the confidence with British public so poorly ? If you were Prime Minister what advice or action you would take to put the England Football Team back on its feet ? Mr Blair has serious blood on his hands and one day will need to meet his Maker (whether in the conventional, or karmic, sense). Is his religiosity a genuine attempt to make amends, or is it an effort to assuage his conscience? After one of the terrible massacres of Muslims by Hindus before partition in India, a Hindu came to Gandhi, horrified at the madness he had been caught up in and said, "I killed a Muslim child, how can I ever repay for what I have done?" Gandhi replied: "Take a Muslim orphan into your home and raise the child as a Muslim, rather than a Hindu." Perhaps Mr Blair is attempting to make amends for his own war crimes? Do you believe you should stand trial for war crimes and crimes against humanity? And, in light of the thousands of people that have died in Iraq, do you require sleeping pills to get a good night sleep or does it not bother you one bit that your decision, based on lies, has ended so many lives? Mr Blair – you should move to Iraq and live there for the rest of your life. Mister Blair, Would you lead a country again? A country like the United States of America? What would you do to help the US get out the crisis ? Raul Vargas, MBA – Boca Raton, Florida. What would you have done if as a servicing British PM. You discover that a nation went to war based on some perceived notion against another nation only to discover that the intels was wrong. Would you just ignored the nation or send the leader to Hague to face the consequences. If given the second chance will you take the position of the british primeminister again mr blair. The ex prime minister had paved a way for helping under 7 years on long term strict immigration laws that bind the young children born in u.k from attending EUROPEANS ACTIVITIES with their colleagues during his tenure in the office. what do you think sir, that the immigrant families should be expecting from the current government . I would ask him how he can stand up and talk about faith and goodness after allowing the Lockerbie Bomber to go free on the say so of a doctor who was not even a specialist on cancer. Did he do it to curry favour with Libya? How could he turn his back on the victims and families of all those people who have suffered for years and are left with huge holes in their lives. Why can't he stand up and say he is responsible. Does he have the intestinal fortitude to stand up and admit the truth ? Some say, that to see the light you must first be immersed in darkness. Has the burden of commiting the UK to an illegal war and the subsequent deaths of hundreds of thousands of human beings been lifted from your shoulders yet? I wounder how your faith is helping you to deal with these most darkest of consequences. My questions are : 1. How do you sleep at night you war criminal? 2. How can you talk about peace in the middle east when you are one of the instigators of violence there? 3. How are you spending the money you earned by helping to start the war? 4. Are there really terrorists, or are all of them MI5 and Mossad agents. 5. Do you believe there is a God, and if you really do, what do you think he will do to you when you die? how do you feel about the way the new gonerment in power i britain are dealing with all british citizen as an indication of the policies they are working towards with. finally i wanna say thank you so much for your hard job. Mr. Blair, you killed many Serbian civilians, including kids during 1999. War in Serbia. 250.000 Serbian civilians fled Kosovo, and nobody care about that in UK and USA. Your troops ethnically cleansed Serbs from Kosovo. Serbs consider you as a war criminal. But, one day we will liberated Kosovo!!! To Dan; TB had nothing to do with the Lockerbie bomber going free. This was a decision made by the Scottish Parliament. The UK government has no say in Scotland's affairs. Please sort the USA out before trying to police other countries. I love America but interference in other countries has to stop. Blair you are a war criminal and should be tried as such.